The Weibo user leaked some details about the next Sony sensor; IMX607, which is likely to be the main sensor for the upcoming P30 Pro from Huawei. 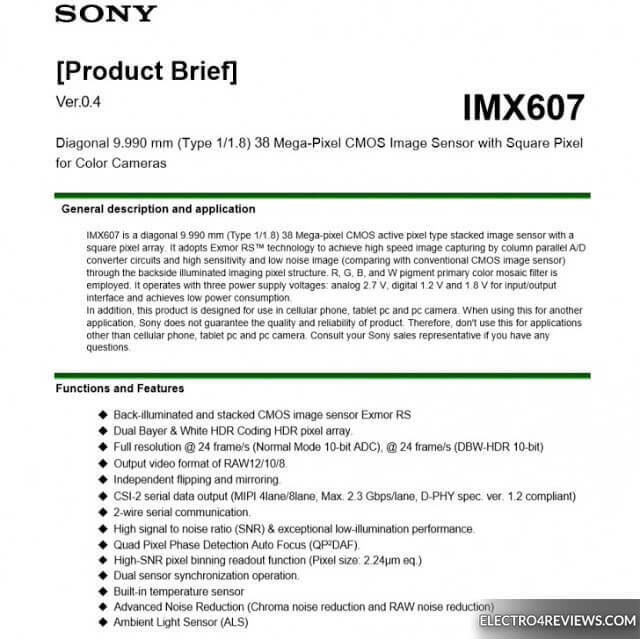 The Sony IMX607 (38 megapixel and 1 / 1.8 lens) is similar to the IMX600 sensor that came with Huawei P20 Pro this year but with some distinctive plugins, adding white pixels and RGB color units. Instead of using Quad Bayer #technology, the sensor will rely on Dual Bayer technology with HDR. It is worth noting that the current IMX600 sensor in the P20 Pro and the Mate 20 Pro uses two color pixels for long exposures and two for short exposure, and they will be combined for improved dynamic bandwidth. The new sensor will do something like this but with some differences. This #Sony sensor should allow the camera to use white pixels to capture more bright images to achieve better resolution without the need for an additional black and white sensor. This sensor should also help to shoot in the dark. For automatic tuning, Sony has introduced the automatic two-pixel pixel detection feature (QPDAF). Other features include a high noise rate (SNR) for outstanding low-noise and ambient performance, combined temperature and ambient light sensors. In addition, one newspaper stated that this sensor was specifically designed for night-time photography, with an ISO 50/500/5000 license certificate.